Finding a luxury executive chair with excellent ergonomic features is easy. The hard part, is finding one within a strict budget. Often, top of the line furniture and seating solutions come with top of the line price tags. Not to fear! This article highlights 5 of the industries best ergo friendly executive chairs under $300. First up, the OFM 580 chair with mesh back and stylish headrest. 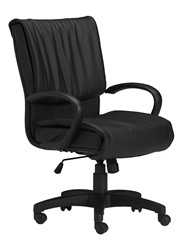 This ergonomic executive chair is all about comfort! With standard features like a 360 degree swivel seat, gas lift seat height adjustment, and adjustable tilt tension, it's no wonder why this unique chair is consistently on the best sellers list. The adjustable height arms and breathable stain resistant fabric adds to the already superior quality the 580 has to offer. Priced at the top of our budget, this awesome product is money well spent. As with all OFM Chairs for the office the 580 model is typically in stock and available for immediate shipment. This comfortable leather office chair features an attractive black Luxhide upholstery on all seated surfaces accompanied by mock leather trim with a decorative white stitch. Priced at only $212.99, it's hard to believe this luxury executive chair comes standard with features like single position tilt lock with tilt tension adjustment, pneumatic seat height adjustment, and polished aluminum arms with upholstered armrests. The polished aluminum base with scuff tips and twin wheel carpet casters add to the out of this world quality and functionality. 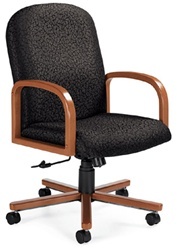 Needless to say, the 11633B Chair by Offices To Go is truly an excellent value. While Mayline office products typically steal the limelight, this top manufacturer also produces a wide range of top chairs for office areas that are sure to keep you comfortable and in style all day! This leather upholstered Mercado Chair is an excellent example of their craftsman ship at work. The Mayline 2547 chair works perfectly in conference rooms or in a complimentary fashion to modern executive style office furniture you're looking to accent. Priced at $215.99, the 2547 and a wide variety of additional Mayline Office Chairs come in well below the $300 budget set for today's article. Finding a stylish wood accented office chair within budget was no easy task. However, the Selectra Chair by Global Total Office fit the bill in every way. This traditionally styled wood accented swivel chair is available in a seemingly limitless selection of textile solutions. The 4016 boasts a medium back design along with standard features including a tilt lock control and height adjustment capabilities. The wood arms and base pull together a wholesome and welcoming feel. This stylish chair also makes a great complimentary piece to any wood conference furniture configuration. Last but certainly not least, the Apollo Mesh Chair by Eurotech Seating. This popular office chair is from a fully line of ergonomic mesh chairs that are sure to impress even the most critical of buyers. The simple modern design and standard ergonomic features make this Eurotech Seating chair a real winner. Priced at only $251.99, these executive office chairs are an excellent addition to any home or business work environment. They pair well with executive desks and also work well in cubicle applications.